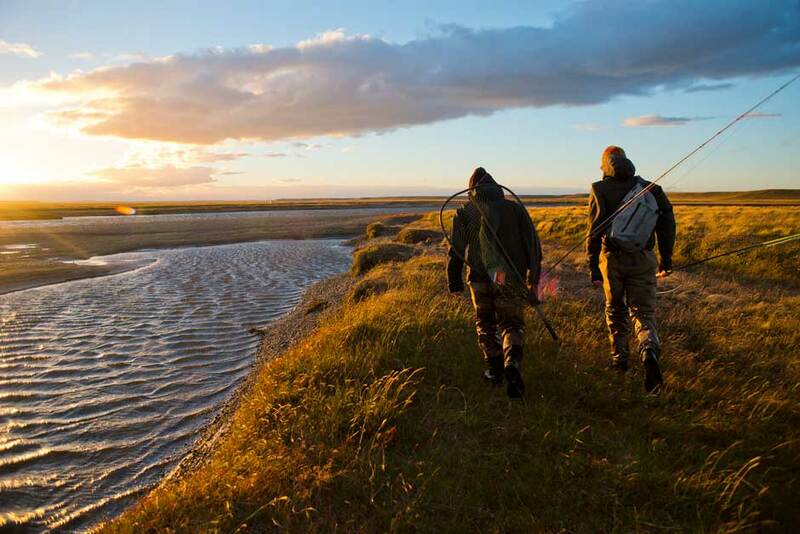 Estancia Maria Behety, Argentina | Tailwaters Fly Fishing Co.
Anglers from North America travel overnight to Buenos Aires, then transfer to the domestic airport for a connecting two+ hour flight to Ushuaia or Rio Grande, Argentina. From Ushuaia (preferred airport) anglers are transferred by ground approximately three hours to the Estancia. Most travelers elect to spend at least one night in Buenos Aires on the front end. Our concierge service and travel agents in Buenos Aires will assist with ground transfers, tours, hotel reservations, and domestic airfare with the local airlines. Two-handed spey fishing for trout that average 10-14 pounds with a handful of fish pushing thirty pounds landed each season. Very easy wading and not particularly complicated tackle. Experienced steelhead and Atlantic Salmon fishermen immediately feel “in their element.” Quartering downstream with streamers or dead drifting nymphs are the most common methods used, and skated dry flies are terrific when the conditions are right. The most sought after dates are late January, February and March, the middle and most pleasant part of the short, near-Antarctic summer. Because the most productive periods of the season shift every year and can’t be consistently targeted on the calendar, the best time to be on the Rio Grande is unpredictable. But it’s all good! Is Estancia Maria Behety Right For You? Estancia Maria Behety is considered one of the most popular and respected fishing lodges on the planet, and the EMB water is considered the best on the Rio Grande. Sea-run brown trout fishing is not typically a numbers contest. Becoming proficient with a 2-handed rod is highly recommended (and not difficult to learn), and experienced anglers should expect to average landing a half dozen fish a day. Swinging flies is not for everyone, especially if you are a dry fly purist. Non-anglers are blown away at La Villa with very luxurious accommodations, however there are not many organized activities outside of fishing. 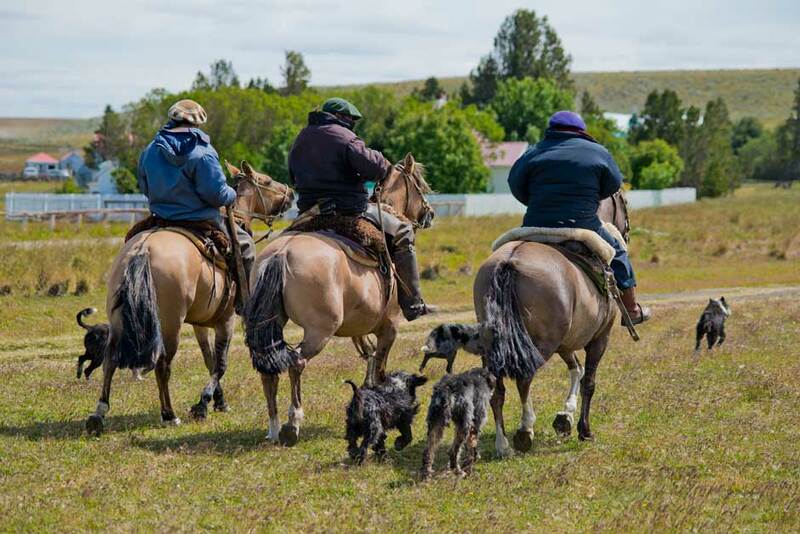 Estancia Maria Behety has different pricing for different times during the season, as well as two different lodging options. 7 Nights / 6 Days Fishing at Estancia Maria Behety Lodge is $6210 to begin the season, $6900 during the middle of the season, and $5520 towards the end of the season. The corresponding pricing at La Villa Maria Behety is $7110, $7900, and $6320. Shorter stays on a case by case basis. Additional expenses include but are not limited to airfare to Buenos Aires, hotel and services in Buenos Aires, Airfare to Esquel with Aerolineas, Gratuities, $160 Reciprocity Tax. See RATES for details. 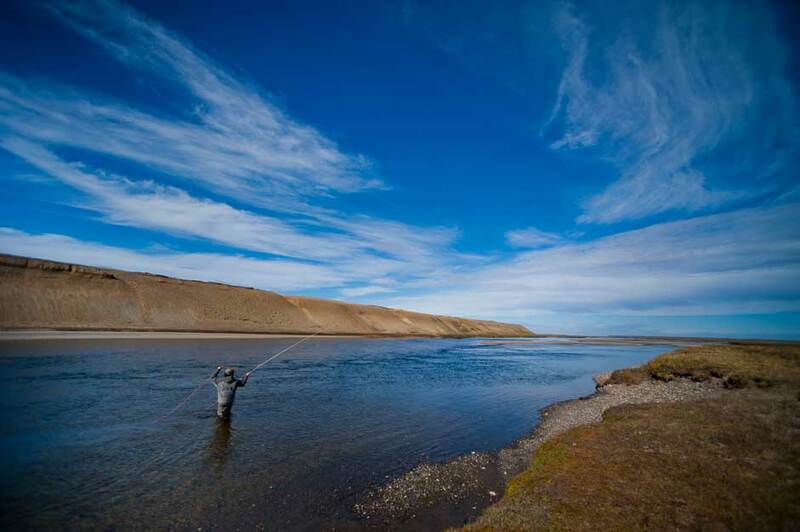 The Rio Grande in Tierra del Fuego is home to the finest sea-run brown trout fishing in the world, and there is no better venue on the river than Estancia Maria Behety. From the intimate and outstanding accommodations, to the five star cuisine and fine Argentinian wines, to the location minutes from more than 100 of the most productive runs on the entire river, to the top quality guides and program designed entirely around the most productive fishing times, EMB is undoubtedly one of the top fly fishing destinations in the world. The proof is that most spots at EMB are booked year after year by the same clients, and there can be a lengthy wait list for openings. To reach EMB, most anglers fly to Buenos Aires and onward to Ushuaia, the southernmost city in the world. The region is one of the most unique on earth, only a few hundred miles from Antarctica. After landing in Ushuaia, guests are picked up and driven several hours to EMB. The Estancia itself is a 275,000 acre ranch with over thirty miles of frontage on the best stretch of the Rio Grande to target these sea-run monsters. EMB has two lodges, one with a maximum capacity of twelve anglers and the other only six. The latter, La Villa Maria Behety, is regarded as one of the most beautiful ranch mansions in South America. The fishing is very similar to steelheading, with two-handed spey rods for swinging flies quickly becoming the tackle of choice. Anglers fish the morning period, return for a lavish lunch and a siesta during the afternoon, then head back out to fish late into the evening. While not on the water, guests are pampered with every luxury imaginable. And because the size of the Rio Grande sea-run browns averages in the teens – with one out of fifty pushing thirty pounds – anglers are sure to return home with fish stories they will tell for a lifetime. Tierra del Fuego (“Land of Fire”) is literally located at the end of the earth on the southern tip of South America. It is actually an archipelago separated from the mainland by the Strait of Magellan and collectively forms the Cape Horn, only a few hundred miles from Antarctica. The Rio Grande is located on a northerly portion of Tierra del Fuego known as the “estepa,” or the region of southern Patagonia signified by its isolation and endless panoramic rolling hills. The Rio Grande River is the most popular sea-run brown trout river in the world. 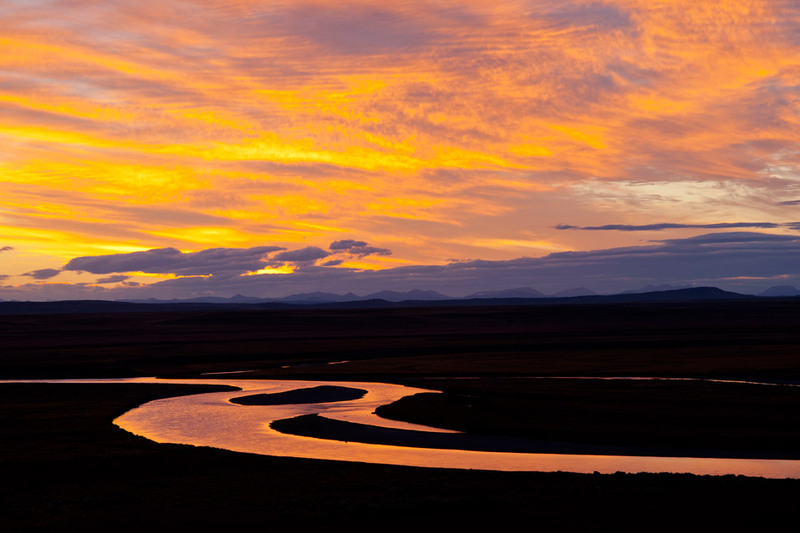 From its headwaters in Chile, the Rio Grande flows east through Argentina about fifty miles to the Atlantic Ocean at the town of Rio Grande. Today the geo-political name, Tierra del Fuego refers to both the island – of which the western half is located within Chile, and the eastern half within Argentina – as well as a specific Province of the Republic of Argentina, comprising the Argentine half of the island and the Antarctic Peninsula. Tierra del Fuego is a very young territory; its first non-native residents came in 1871. Its first town, Ushuaia, is the southernmost city in the world and was founded only a hundred years ago. Estancia Maria Behety operates two separate lodges on the same massive property. The main Estancia Maria Behety Lodge and the restored mansion called La Villa Maria Behety. The fences of the Estancia Maria Behety surround 495 square miles of cattle and sheep grazing country, approximately 275,000 acres. All of these pampas border the northern bank of the Rio Grande opposite the Estancia Jose Menendez and Estancia Despedida. The three fishing lodges on the opposite bank alternate daily use of around 32 miles of Estancia Maria Behety river frontage in a friendly, organized and harmonious relationship that insures a quality and private experience for everyone on the river. From its promontory nearly 20 miles from the estancia entrance, Estancia Maria Behety Lodge and La Villa Maria Behety are within minutes of more than 100 of the finest pools on the river and their location alone ensures one of the top trophy trout trips on the planet. The distinctive architecture of the historic turn-of-the-century ranches of Tierra del Fuego is incorporated in the design of the lodge. The view from both lodges is a breathtaking panorama that encompasses the river valley and the remnants of the Andean cordillera to the West. The main lodge is limited to only twelve anglers for each of the 14 weeks of the season, while La Villa holds a maximum of six guests per week. Though most of the Rio Grande is on the Chilean side of the border, nearly 80% of the prime spawning habitat and all of the Rio Grande’s best fishing is on the Argentina portion of the island, much of it in the first 45 miles above the river mouth. The maximum combined occupancy of all the Rio Grande lodges between the Atlantic Ocean and the Chilean border is about 50 anglers. That’s an average of nearly a mile of private water for every single fisherman. Everything about Estancia Maria Behety revolves around the Menendez Family’s personal guarantee and total commitment to offering the finest fly fishing experience in the Americas. The guides are renowned for both their intimate knowledge of the Rio Grande and consistent success in bringing monster sea-run trout to hand. All of the guides at the lodges on the Rio Grande are Argentines. In fact the entire staff and management at both lodges on the Estancia Maria Behety are home grown; the chefs, hostess, maids, yard boys, every single employee is there to meet and/or exceeded your trip expectations. Fishing for sea-run brown trout is very similar to fishing for steelhead in many ways. Like steelhead, which are anadromous (sea-run) rainbow trout, the brown trout of Tierra del Fuego actually return to the ocean each season to feed and grow. They return to their natal waters on the Rio Grande River to spawn each year, and offer an incredible opportunity for anglers to catch some of the largest and liveliest brown trout on earth! Sea-run browns on the Rio Grande average 10 – 14 lbs, and experienced fly rodders usually hook about a half dozen per day. Trophy fish in excess of 20 pounds are not uncommon and about one in 50 is a monster pushing 30 pounds or more. The character of the water on the Rio Grande is for the most part wide and slow moving as it meanders down from its headwaters in Chile. It is perfect habitat for swinging flies with heavy single handed or spey rods to fish laid up in pools waiting to push up stream. Tackle and techniques on the Rio Grande are not very complicated. Anglers choose from a broad range of lines, tips and terminal tackle according to the water conditions. Experienced steelhead and Atlantic Salmon fishermen immediately feel “in their element.” Quartering downstream with streamers or dead drifting nymphs are the most common methods used, and skated dry flies are terrific when the conditions are right. The Rio Grande is one of the easiest streams to wade in the Americas. 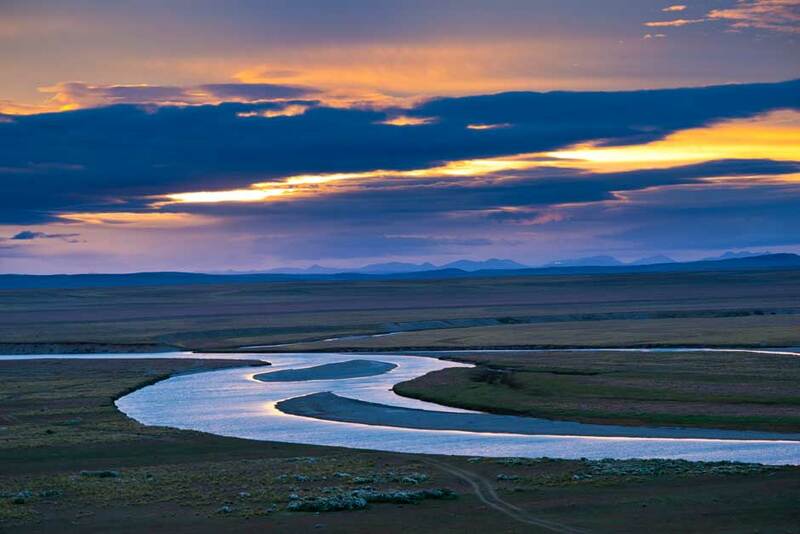 The river is seldom more than thigh deep, and can be easily crossed between pools. There’s no moss on a bottom made of nothing but perfect spawning habitat ranging in size from pea gravel to golf ball sized rocks. Leave your studded boots at home because there isn’t a rock big enough on the Rio Grande to trip over. Fishermen start each morning with a light breakfast of fresh fruit, cereals, yogurt, toast and coffee, as well as a full American breakfast (for those that have the room), followed by a full morning of fishing. Each two anglers share a guide and vehicle. Their beat usually consists of two to four pools, all for themselves. Fishermen typically return to the lodge by 1 o’clock in the afternoon, where a delicious midday meal is served, perfectly complemented by local wines, followed by a well-earned siesta. Anglers, well-fed and rested, fish the evening session right up to (and sometimes beyond) the brilliant Tierra del Fuego sunsets. They’ll then return to their respective lodges, in time to regale each other with tales of giant fish, then sit down to yet another meal that would put many five-star restaurants to shame. By this time you have been ridden hard and put away wet, only to rise the next morning and start it all over again. With two long fishing periods separated by lavish meals and sleep, its as if each fishing day has magically turned into two. What a wonderful way to be treated . . . EAT, SLEEP, FISH, EAT, SLEEP, FISH, EAT, SLEEP, FISH . . . Hooking up with a big sea-run brown is an emotional fishing experience that defies accurate description. Most fish grab a streamer or nymph on the swing and your first notion is you’ve hooked a snag. But there are damn few snags in the Rio Grande. It’s about this time when the three-foot long “snag” starts violently shaking its head, and its time to plant your feet and get ready for a fight. These big brown trout are much like Pacific salmon and steelhead, in that they’re most active in low light conditions. The scientists call them nega-phototropic, and as the sun gets higher, fish retreat to the deepest parts of the pools. Perhaps it’s because they’re used to the deeper sea, or they feel exposed to predators in bright sunlight, but it’s a fact they’re more aggressive and much more likely to strike a fly in the early morning, late evening, or when it’s overcast. In mid-day, when the sun is at its highest, they’re unlikely to respond to even the most perfectly presented fly. One of the reasons so many photos of the Rio Grande mega trout look like deer caught in the headlights is that most are caught early or late in the day. Most anglers arrive shortly after first light and will see dozens of fish rolling on the surface of the pools in the blush of the dawn. Action is usually red hot for a couple of hours and then begins to taper off. The reverse is true at the end of the day, and it’s maddening to leave the river when the light has disappeared and the fish are still exploding all around. The fishing schedule is designed around the best fishing times. Really, the Argentines have mastered the art of squeezing two fishing days into one. Much is said about the winds of Tierra del Fuego, and it is seldom good. The truth is that the Rio Grande isn’t super wide, casts are seldom seventy feet, and almost never directly into the wind. Competent casters have little difficulty adjusting to the almost constant gusts and even those that struggle agree quickly that the results are worth every effort. Two-handed rods have become very popular on the Rio Grande and are excellent tools for covering the water, especially when the wind is howling or the river is up and wider than normal. In the last three years we have seen a dramatic increase in the number of Rio Grande anglers using two-handed rods. 75 percent of the Rio Grande anglers are fishing the big double-handed guns now. Two-handed rods are arguably the most efficient tool to fish the Rio Grande; they make it easy for a lot of anglers, especially those with shoulder or elbow problems. Single-handed 8-weight rods matched with stout reels and an assortment of interchangeable tips still have their place on the Rio Grande, and in the right conditions fish can be taken on the surface. However, sink-tip lines, streamers, and nymphs account for the vast majority of trophy trout. Guests have the option of booking trips to one of two lodges on the massive Maria Behety property. This includes the main lodge building as well as the more intimate and opulent La Villa. The Estancia Maria Behety Lodge sits on a promontory overlooking the Rio Grande with panoramic views of vast pampas and the remnants of the Andean cordillera framing the background. 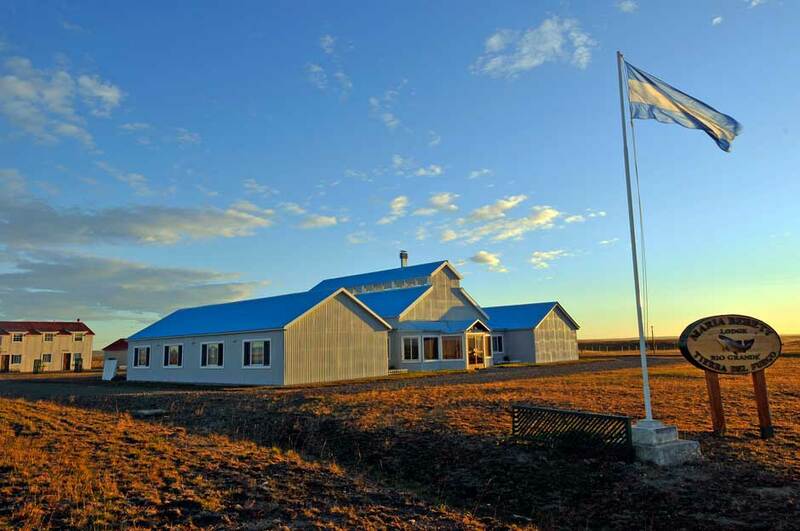 The lodge was built in 1999 and its architectural style is typical of structures built in Patagonia in the early 1900’s, with the addition of all the modern convenience and amenities you would expect in a 21st century fly fishing lodge. There are 8 double occupancy rooms in the lodge that can accommodate a maximum of 16 guests, though EMB limits it to 12 anglers total during a typical week. The extra rooms allow a handful of anglers to secure a private room for a nominal additional cost. Each large guest room is attractively decorated and features two double beds with a shared nightstand, a full dresser, and ample closet space. A full bath with two vanity/sink areas and a walk-in glass shower complete each guest room. Each two guest rooms share a sizable common room which is a terrific space to store extra gear, get organized, tie some flies or sit and relax with a good book while anticipating the next fishing sortie. A large fireplace anchors the main room and several sitting areas are the gathering spot to re-live the fishing of the day and relax with wonderful appetizers and a cocktail. A full bar is well stocked with all the right libations including the finest Argentine wines and plenty of ice cold beer. Dinners are served in the main dining room just off the great room. A separate room at the front of the great room, “The Bad Boys’ Room,” was built especially for those that enjoy a good smoke. Additionally, there is a computer with internet service to check emails as well as a complete gift/tackle shop. Meals at Estancia Maria Behety revolve around the two fishing sessions per day schedule. Usually anglers are up at 7:00 a.m. and fresh coffee and hot tea is available to shake the cobwebs out. In the dining room a sideboard is topped with fresh fruit, hand-squeezed juices, yogurt, cereals, toast and pastries. For those that prefer a more traditional American breakfast, cooked to order eggs, omelets, potatoes, bacon and ham are available from the kitchen. As is typical in South America, the midday meal is grand, a full sit down meal with great wines, delicious desserts and good strong coffee. Dinners are served later than most visitors are accustomed to in order to accommodate the late evening fishing session typical on the Rio Grande. Dinners are usually lighter than the midday meal and a perfect night-cap before getting some sleep and starting all over again the next morning. Your days at Estancia Maria Behety are full . . . The lodge holds 16 guests, however only offers guided fishing permits for a maximum of 12 anglers per week. Guests at La Villa enjoy a meticulously built and finished single level lodge that is comfortable, warm, inviting and efficient, designed exclusively with anglers in mind. The architectural style inside and out at La Villa is turn of the century Patagonian with the addition of every modern convenience available. All the rooms at La Villa are private, single occupancy rooms, elegantly decorated featuring a spacious private bathroom with a glass walk in shower, Jacuzzi tub and large vanity and sink area. During non-angling times between double daily fishing secessions, guests gather in one of two living areas where they tell fishing tales, enjoy cocktails and anticipate the next fishing sortie with the warmth and comfort of a crackling fire burning in the fireplace. The dining schedule at La Villa is determined by the fishing program and every consideration within reason is given to the most productive times to be on the river. All meals are served in the formal dining room; creations of talented Argentine chefs use fresh ingredients from the greenhouse and meat raised and processed on the estancia. A fully stocked 9,000 bottle wine cellar featuring some of the finest Argentine varietals and full open bar add to the experience. Other amenities at La Villa include radiant floor heat, 24 hour internet service, wader/equipment room, designated fly tying areas and gift and tackle shop. La Villa holds a maximum of 6 guests per week in single occupancy bedrooms. Guests fly direct to Buenos Aires, Argentina from Dallas/Ft. Worth, Miami, or New York on an overnight flight arriving the following morning. Fishermen then gather their luggage, clear customs, and are met by a driver who transfers the group approximately one hour to the Domestic Airport for the flight to either Ushuaia or Rio Grande aboard Aerolineas Argentina or Lan Airlines. Upon arrival in Ushuaia or Rio Grande, the group is then met at the baggage claim by a Maria Behety staff member and driven to the Estancia. and more flexible – flight itineraries between Buenos Aires (AEP) and Ushuaia then there are to/from Rio Grande. The advantages of the Rio Grande routing is the short drive from the airport to the lodge, however this is a once a day flight with a very early departure out of Buenos Aires (which requires an overnight in Buenos Aires the night before). Regardless of the routing, we will coordinate the meet and greet at the airport and auto transfer to the lodge. If you use LOL’s service, you can also think of them as your personal concierge to the city of Buenos Aires. They can recommend and make dinner reservations, get you tickets to events, show you around the city, take you shopping (or shop for you), change local currency (for a better rate), answer questions, or just enjoy a drink and get to know you. Please count on Gaia and her staff to provide you with a memorable experience in Buenos Aires. None of LOL’s services are included in the price of the Estancia Maria Behety trip and we will make all intros with LOL and assist in making all these arrangements. The following itinerary reflects the traditional travel schedule with an evening in Buenos Aires prior to pushing onward to Tierra del Fuego. In some cases, depending upon your city of origin, it may be possible to depart the USA on Friday evening and make a connection to Ushuaia and onward to EMB on Saturday. Upon arrival at Buenos Aires International Airport (EZE), anglers gather their luggage, clear customs, and are met by a driver who transfers the group approximately one hour to a hotel downtown. Guests have the option of taking guided tours, organized dinner plans, tango shows, and a night on the town in B.A escorted by our concierge partners at LOL Argentina. Guests are collected at their hotel mid morning and driven 10-15 minutes to the domestic airport for the flight to Ushuaia, Argentina aboard local carrier Aerolineas Argentina. Tailwaters uses a very reliable customs assistance and chauffeur service that operates comfortable, air-conditioned vans. LOL’s staff of drivers make sure you are properly checked in for your two-hour domestic flight to Ushuaia. Upon arrival in Ushuaia, the group is then met at the baggage claim and driven to the lodge. Six full fishing days on the Rio Grande for Sea-Run Brown Trout! Each of the angling days is spent fishing in both the morning and evening. The beats are rotated, and normally anglers will not have to repeat any pools during their stay. Fishermen return to the lodge in the heart of the ranch to enjoy a mid-day meal, and have the chance to relax for a few hours. The lodge is only a short distance from the river, no more than half an hour to the most distant beat on the huge ranch. Continued overnight at Estancia Maria Behety. After breakfast guests are transferred back to Ushuaia or Rio Grande for the flight to Buenos Aires. The group is then picked up and transferred back to the International Airport and assisted through check-in for your flight on to the United States. Overnight flight back to USA. The big sea-run brown trout start to return to the pools of the Rio Grande in significant numbers around Thanksgiving. Less than a month later the river is loaded with fish and it is estimated that by the first day of each New Year, nearly 80% of the escapement has reached their annual family reunion. That translates into more than a thousand monster trout per river mile. The fish initially herd up in the best lower river pools, though hundreds more of the silver sea trout continue to pour into the Rio Grande on every high tide, twice a day until sometime in May. The most sought after dates are late January, February and March, the middle and most pleasant part of the short, near-Antarctic summer. Because the most productive weeks of the season shift every year and can’t be consistently targeted on the calendar, the best time to be on the Rio Grande is unpredictable. But the fishing is typically good every week the lodge is open! Consider that thousands of these huge fish are caught each season, yet when population studies are compared to accurate catch records, it’s clear that a surprisingly small percentage of the fish present (which don’t actively feed after they return to the river) actually end up being hooked. What triggers their aggressive behavior and when it happens is arguable, but what can’t be challenged is that every week on the Rio Grande can be, and usually is, phenomenal. Early season fish are very aggressive, full of fight, and acrobatic. 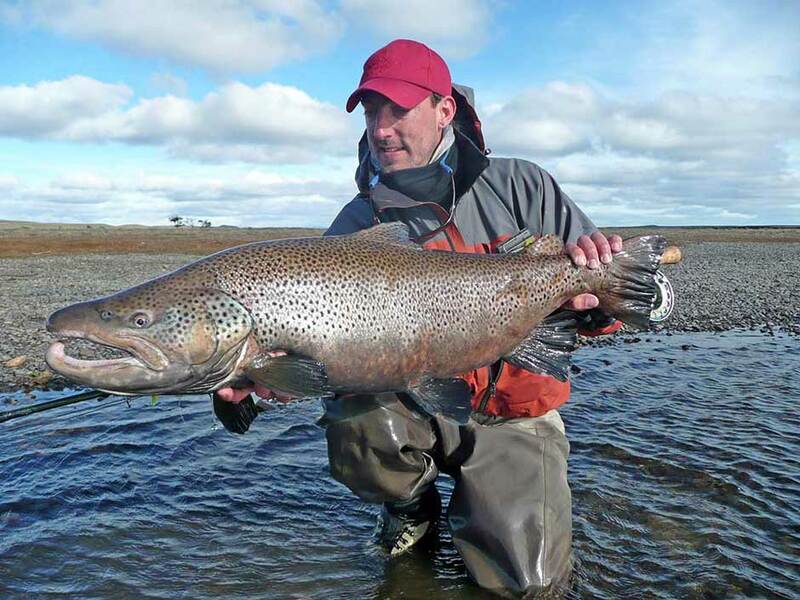 They move readily to dries, and three of the largest sea trout ever recorded were caught and released in January. While mid-season offers the most pleasant weather, the best weeks ever recorded have been the last weeks of the season. Randy Berry and his friends from Teton Valley Lodge in Idaho once averaged 53 fish per rod during what some consider to be the most difficult week of the Tierra del Fuego summer. When the weather cooperates, nearly every day of the season is good! Guest capacity at our Rio Grande properties is purposely small in order to deliver exceptional personal service and a world-class fishing experience. Our lodges’ limited capacity, as small as six and no larger than twelve, results in space becoming extremely tight, especially during high-demand months of January, February and March. Therefore, if you are serious about booking a trip to the Rio Grande, it is important to get on the wait list as soon possible. Usually by the end of May we are in position to offer rod space to those on the waiting list. That is not to say that prime space isn’t available later in the year, but if you are set and going and want to secure pick-of-the-litter dates – get on the wait list and book early! 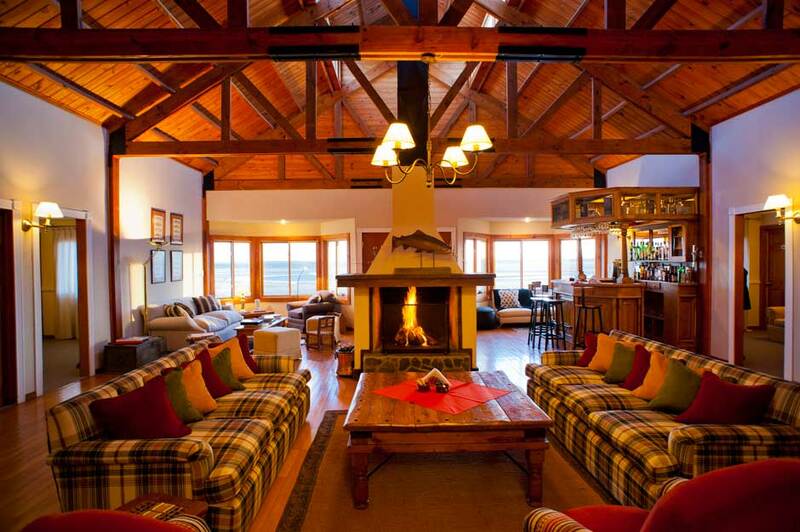 La Villa de Maria Behety is the most deluxe fly fishing lodge in all of Argentina. Guests enjoy the old world charm of the beautifully restored Menendez family mansion, and no lodge in Tierra del Fuego is more appropriate for non-anglers. Amenities beyond near-exclusive access to the superb fishing include a 7,000-bottle wine cellar, private rooms, Jacuzzi tubs, and a marvelous kitchen. Fly fishing is the predominant activity at both lodges. Non-anglers are welcome to join fishing guests to the main lodge, however there are very limited non-angling activities available other than hiking, relaxing at the lodge, and observing wildlife. The warm hospitality on the ranch and gorgeous landscape is a very calming place to enjoy a book and relax while angling companions are on the river. 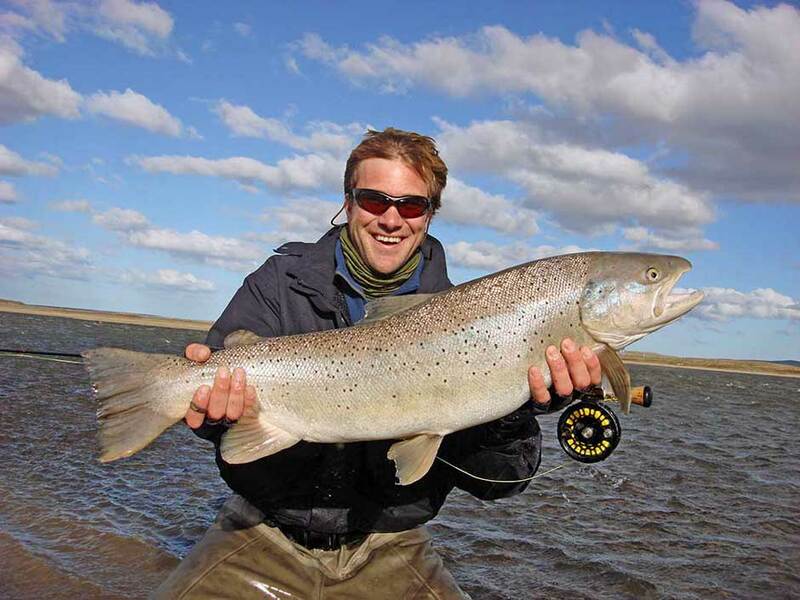 Guided fishing; Meals; All beverages including Argentine wines and cocktails (Open Bar); Ground transportation to/from Ushuaia or Rio Grande Airports; Fishing Licenses. Tailwaters Travel must adhere to the cancellation policies of the guides, outfitters and lodges which it represents. Estancia Maria Behety’s policy follows: A fifty percent deposit is due at the time of booking to confirm all reservations. Full payments are required at 60 days from departure. Deposits and all payments are nonrefundable unless replacement clients are found. Finding a replacement for a South American trip on short notice can be very difficult and, at times, impossible. Receipt of deposit and/or final payment is acknowledgement that registrant has read and accepts the cancellation, refund and responsibility clauses.